Power On – all Night Long! Figure 1: Luggable (9,000 mAh, 10 pounds) Big. I have built two different rigs for powering my Canon 40D, 50D and 5D Mark II cameras. Each of the beefy battery solutions here can run continuously for up to a dozen hours – and longer. When I say a dozen hours I mean a dozen hours of continuous shooting. One rig I call my luggable weighs about 10 pounds and uses a 12 volt, 9,000 mAh sealed lead acid battery in a box that can be used to jump start a car – it has jumper cables on it. The total capacity of the battery is 108 watt-hours. My second lightweight solution is 7.4 volt, 8,000 mAh (56 watt-hour) combo that is much more portable because it weighs less than two pounds. I explain what “mAh” and “watt-hour” mean in the glossary below. To power a Canon DSLR a battery eliminator is required. Battery eliminators can be purchased from Canon ($$) or after market companies ($) or the can be fabricated (¢) by anyone who knows which end of a soldering iron is safest to hold. See below under “Battery Eliminator” for options. *If you have a Nikon, e.g. model D200 you may find a somewhat simpler solution – or more complicated depending on your point of view. The D200, for example, can be paired with the EH-6 AC adapter which mates with a DC power connector on the camera. The EH-6 apparently supplies 13.5 Volts to the connector. One D200 owner found that he could attach a 12V battery directly to the DC-in connector and power his camera. And attaching a 7.4V battery seemed to work just fine! Unfortunately the on-camera connector is not a standard size and it seems nearly impossible to get one without plunking down cash. So why did I bother to build these things? I typically like to hike into the wilderness, set up my rig for star trail work and go to sleep. The shutter will be open nearly continuously for 4, 6 or even 8 hours at a time. While my descriptions are specific to the Canon, a similar approach works for other cameras and camera vendors. Indeed, the Nikon D40 battery, the EN-EL9, is a 7.4V battery, too. Six hours of run time is more than can be achieved with a single high capacity battery and also beyond the capacity of a battery grip that holds two high capacity batteries. Since I hike with my solution it must be portable. The luggable rig pictured above in Figure 1 is obviously not ideal for hiking. The “Start It” unit weighs almost 10 pounds. On the other hand, I can keep the jump start kit in my car and perhaps avoid a dead car battery. The “Start It” will fully charge if I connect it to the car accessory power plug for 2-3 hours which is convenient when driving to remote locations. The lightweight rig at about half the capacity is highly portable. Indeed, two BP-970 camcorder batteries totaling about 3 pounds exceeds the power of the luggable solution. Nontheless I use both solutions. Let me walk through each solution. 12V Car battery or jump start device. Your car (that power/cigarette lighter socket can come in handy)! DC-DC converter because a 12 volt battery is too strong to power a camera which wants to be fed 8.2 volts or less. Buy a battery eliminator: eg. the Canon DR-400 $30. Cannibalize an old/non-working battery or hack up a new, cheap one. Build a battery dummy out of wood, plastic, or similar non-conducting substance. The device I bought, the Jump Start, is a small 12V auto battery with a handle, jumper clamps and a power port (cigarette lighter) socket. The luggable solution also requires a DC to DC converter. The converter will accept anywhere from 12 to 18 volts and has a dial to select the output voltage with choices of 3/5/7.5/8/9 or 12 Volts. The $19 device lists itself as a 3000mA (3.0 amp) unit. The converter has an inline fuse to “blow” if too much electricity runs through it – this is a good thing as it will help protect the camera and the battery. The device I purchased from Fry’s Electronic is labeled “3000 mA Rhino Intelligent Adapter” but I haven’t been able to match that with anything on the internet or find anything similar. The closest match I found is a 1 Amp unit, or this unit. Many people like me have a big assortment of “cigarette lighter” chargers, and one of them may be able to do the job. Inspect the unit carefully to determine its output voltage and capacity which are often labeled right on the unit. For example the label might read: Input 12VDC, Output: 7.5VDC 500ma which means its output is the right voltage, but at only 500 milliamps it may be too puny to keep the camera fed. Figure 3: A 3amp 12V selectable converter which includes 7.5 V.
I discovered that an old Nokia cell phone charger, the Nokia LCH-8 converts 12 to 24V from your car battery to 7.5 volts DC at 650 ma. In theory this might be enough except that I’ve read reports on the internet that measured peak usage for the Canon is 1.4 amps (1400mA). Clearly the Nokia can’t sustain that much current, but if it is for a short period there is an electrical trick to allow this – add a big capacitor. I haven’t tried using the Nokia charger. There are other options, too. For example Harold Davis purchased the Vagabond II Portable Power System ($299). This is also a beefy (really beefy) battery which features 12 volt output and a built in inverter for powering a 120 Volt outlet. The battery sports 240 watt-hours. That is huge. The most serious detraction is the weight and bulk. It is a self contained system that weights 18.6 pounds. If the 120 volt output is used, it also means that an A/C adapter for the camera must be used. The Vagabond’s built-in inverter must be paired with an A/C adapter for AC-DC conversion. Converting power from 12 volts DC to 120 Volts AC and then back to a DC voltage will cause as much as 35% of the electrical energy to be wasted – but given the huge size of the battery and the additional versatility the loss of power may not matter. A smaller, lighter cousin is also available the Vagabond Mini. At $240 and 3.5 pounds total weight it is more portable. The unit still has a substantial 130 Watt-hour rating. The camcorder or Remote Control (RC) battery is a lighter and more portable solution that uses off-the shelf parts – but assembly is still required. Lithium technology does not supply as much power in very cold climates as a lead-acid car battery solution. Camcorder batteries are large compared to the 3oz battery for my cameras and camcorder batteries are relatively hefty at almost 1 pound. But, with that weight you get 5 to 7 times as much power! Taking two of these with you on a back pack trip is feasible. Not something you can say about a 10 pound solution! In fact, 8 pounds of Lithium Ion (camcorder batteries) will last longer than 40 pounds of sealed lead-acid batteries. At the core of the lightweight solution is a camcorder battery and a charger suitable for that battery. I blatantly ignored the “do not disassemble” label on my charger. The unit I purchased has two phillips screws located beneath a large sticker on the back. After disassembly I discovered that there was plenty of room inside the case for an additional power jack (6). I wired a power jack into the unit by finding where the spring loaded battery contacts went, carefully cutting the wires and attaching them to the power connector, then attaching wires from the power connector to the place the battery contact wires originally went. The power jack that I added has a “Normally Closed” switch which completes a circuit when there is no plug in the jack. It was probably not necessary to take the precaution, but safety when 120 volts are involved is a good thing. A: a replacement BP-970 Camcorder battery. Several capacities are available. I chose two 8,000 mAh batteries at $31 each from Amazon. I also purchased a charger for this battery. B: a camcorder battery charger for the above battery. This @ $10, or this @$15 seems just fine. I have also purchased another charger: the Lenmar which is a tinkerers dream because it comes with easily modifiable plates to accommodate different batteries. B: charger with additional “battery out” power jack (6). battery case back together with hot melt glue along the corners on the inside. F: “Cheater” power cable – basically a length of double wires with a part number (3) soldered at each end. *** You may be wondering why I didn’t just put a plug (3) at the end of the battery eliminator – it’s because a DC-DC converter will normally provide a PLUG not a socket. I can also make a longer or shorter cheater cord if need be. The two screws that hold this unit together are underneath the big sticker on the back. I poked holes through the sticker using a phillips screw driver. If you are uncomfortable with messing with the guts of the charger, you can modify a plate from the Lenmar charger instead. The Lenmar comes with interchangeable plates to accommodate different batteries. or you can get a cheap travel charger. I find it convenient that my charger and “battery connector” are the same unit. And the charger is quite light. small parts holder (chip clips will work). A drill (and drill bit of the appropriate size for the chassis mount jack (6)). You may also need a phillips, hex or regular screwdriver to disassemble the battery charger.I originally purchased a sub-mini audio connector and tried to use that as the power connector but the connection was not crisp or reliable. And finally you may also need contact cement and/or a hot glue gun to reassemble the battery eliminator and possibly the charger as well. Unless your camera or battery grip has a power connector any “big battery”solution will require a battery eliminator (parts C, D and E) or a DC input plug (hooray to Nikon for getting this part right, boo for the lack of availability of those connectors!). You can buy a battery eliminator – see more below – for many cameras but I found it easy to make a battery eliminator for my BP-511 battery out of a junk battery. For Canon cameras the battery eliminator plugs in where the battery goes and wires exit through a rubber gasket and are then connected to an external power source. While making a BP-511 eliminator was easy, I also tried to make an LP-E6 battery eliminator from a new (but cheap) LP-E6. I gutted the battery and soldered wires. The outcome was less than stellar as the contacts in the LP-E6 are small and very close together. Those who fear the soldering iron can purchase an ACK-E2 or a cheaper knock off. Had I found the $20 knock off I would not have bothered hacking up a battery. 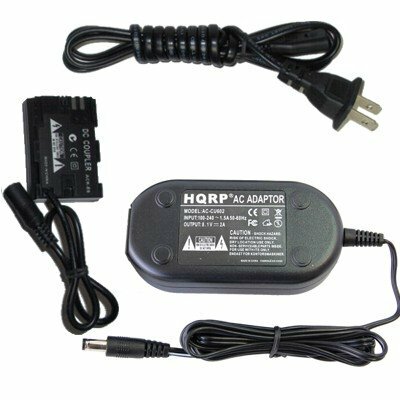 The ACK-E2 includes a battery eliminator and an AC power adapter to power the camera from a 110 volt outlet – I almost never am near wall power, but I can use the battery eliminator. For my other camera, the 5D Mk II Canon sells the ACK-E6AC. Cost is about $140. Like the ACK-E2 the ACK-E6AC includes a battery eliminator and an AC wall unit. However I found an equivalent unit for $39. No need to struggle with disassembling and soldering a battery eliminator! I doubt the AC components are UL listed. The knock offs certainly feel cheap. The connector between the AC unit and the dummy battery is not standard. Different manufacturers use different connectors. The connector on my ACK-E6AC knock off matched the Radio Shack M size power plug I had already been using. Oh happy day! NOTE: Some camera models, like the Canon 5D Mk II have batteries with “chips” in them to help the camera know the current battery state. Your camera may – or may not – require this chip. Without the chip the camera nags you whether it is “ok” to use a battery that it can not talk to. Just say yes. Figure 5: The homemade BP-511 battery eliminator installed in a Canon 40D camera. Canon cameras have a little rubber gasket that allows a cable to exit the battery compartment. If you build your own eliminator make sure your cable exits your battery eliminator where it will be able to be routed out of the battery compartment. If you do it wrong, you’ll have a battery eliminator that does not work because most cameras do not supply power to the camera electronics unless the battery door cover is fully closed. This is also true for most battery grip attachments. The typical Canon BP 511 battery supplies 7.4 volts** to the camera and boasts a 1390 milliamp-hour rating. 1390 maH means that if the camera draws 1.39 amps it could run for an hour. That kind of power is possible with lithium batteries – the most power for the least weight of any currently available options. It’s also possible with SLA (Sealed Lead Acid) and a variety of similar battery chemistries. The battery you have in your car is a suitable choice, it’s just quite a bit heavier than most people are willing to carry. Smaller lighter versions of that same battery are available for things like lawn tractors and, “Jump Starters”. **First you need to know a little secret. A “12 volt” battery is really around 13.8 volts when fully charged. Likewise the Canon 7.4V battery is about 8.2V when fully charged. During use the voltage will drop to the point where it will no longer be able to service the camera. At that point it is wise to stop using the battery… going further, especially with a lead acid type battery, may permanently damage the battery. Using a 12 volt car battery with a camera that expects 7.4 volts is, well, a possible cause for problems. The camera probably CAN sip from the 12 volt supply, but it would be kindler and gentler to chop that voltage down using a “voltage regulator”. In particular a “DC to DC” regulator is best here. A DC to DC converter (sometimes called a “buck”) drops the voltage down to a manageable level. Confused about Volts, Amps, MilliAmps? electrical equivalent of “air pressure” is “voltage”. Just as car tires require more air pressure to work than soccer balls do, so do some circuits require more voltage than others. Amps (or milliamps) = “flow rate”. It will take a lot less time for a tire to go flat if there is a huge hole where lots of air can escape than it will for a pin-prick sized hole. The “rate of escape of air” is the electrical analog of current which is measured in amps. A milliamp is a thousandth of an amp. Resistance. In our analog, the “size of the hole” is a good example of the electrical term resistance. And it’s not a surprise since the volume of air that can escape in a second will depend on the pressure and the size of the hole the air can pass through. Capacitance. A capacitor is a device that can hold a charge. In the air pressure world, a tire is a capacitor. You can fill a tire with air, then use the pressure in the tire a little at a time – or all at once – to inflate something else like a balloon. mAh – an abbreviation for milliamp-hour. Milliamp-Hour is one milliamp of current for one hour. Milliamp-hours or amp-hours describe how much energy a battery can supply and for how long – under normal conditions, that is. Here is another important tidbit… just because a charger for a camera battery is available does not mean the charger can be used in place of the battery. There are two reasons for this. The first reason is that chargers MUST supply more than the normal maximum battery voltage. Using an air-pressure analogy: to fill a tire, the pump must exert greater air pressure than the current pressure in the tire. Likewise to charge a battery, a greater voltage must be applied than the final voltage the battery will attain. The second reason is that the charger does not have to supply much current, a trickle is all it needs to slowly charge the battery – just as a bicycle pump can inflate a truck tire. The camera, however, sometimes takes “gulps” of current – more than the charger may be able to supply. Knowing that a 7.4V battery is really about 8.2V helps makes it clear that ANY voltage in the range of about 7 to 8.5 volts will make a (Canon) camera happy IF it can also supply enough amps. Timescapes.org has a lot of great discussions. This entry was posted in Batteries, Gear and tagged ack-e6, battery, Canon, diy, do it yourself, dr-e6, eliminator, long life, portable power on January 3, 2011 by Steven Christenson. Note that different cameras require different “battery eliminators”. The examples above all show a BP-511 battery as used in the Rebel XT, 40D, 50D, 20D, 30D and a few other models. The Canon 5D Mark II (and 7D and 60D) use the LP-E6 battery. The ACK-E6 AC Power kit (http://www.amazon.com/dp/B003WGIYMK) is a good starting point if you don’t want to hack your own battery eliminator out of a LP-E6 battery. Rebel XTi uses the NB-2LH battery. For the Rebel, Rebel XT, and Rebel XTi, *I believe* the best solution is to get an ACK-DC20 knock off (see http://www.amazon.com/dp/B003CLOSNY). And use that for the battery eliminator. It is usually safe to buy a cheap battery and make a battery eliminator by gutting it -but that could be dangerous and it is certainly wasteful. Note: Canon tends to call their battery eliminators “DC Coupler”s – but they are not consistent in that terminology and even their own site doesn’t always list the matching couplers for their equipment. Double check everything before placing any orders, I will not be responsible if you purchase the wrong (or right thing)! One reader, Anthony, reported that the Camcorder battery charger he ordered was quite different from the one (http://www.amazon.com/dp/B001T9N10C/bearhome) I reported above even though the photo and description are the same. If the charger works and can accommodate a jack then it should not matter unless the unit is so cheaply made that it will fall apart. On the other hand, I found modifying a plate for a Lenmar Charger (http://www.amazon.com/Lenmar-SOLOXP-C-Universal-Li-Ion-Charger/dp/B000VNKGKU/bearhome) to be much simpler and the connection is a bit more reliable. Just for future reference- here is current available version of a DC-DC converter from Walgreens of all places for $10. It has a USB port too. ps- this one is 1800Ma versus the 3000Ma one you have pictured- but I am able to use it in live with mode no problems. There is a BP511 compatible solution (A632), an LP-E6 compatible solution (A636), and a few others. A Nikon solution is in development. Another well made solution (all pre-built, no custom wiring) is the Paul C. Buff Vagabond Mini. It’s not ideal in that you have to also use a power inverter (AC to DC converter), but it’s certainly very versatile. @Steven: an older version of the Vagabond Mini included the option to charge the lithium battery via an auto jack, but the current solution no longer supports that. Too bad! – it would be pretty handy to recharge while in transit, on longer road trips, etc. The device can also be powered (but not recharged) by a 12v battery (I’d have to make the cable). Any last words of caution or advice? Sorry, I’ve got no direct experience with the Vagabond Mini. I think internally it is a 14 volt solution which is why charging from a 12v battery isn’t supported. However if it charges through the wall, you can use an inverter (12v to 110AC) into which you can plug the charger. I do this all the time while driving to charge my regular (and big) batteries. Just be sure to get an appropriately sized inverter (800 watts, for example). Right you are.. “The battery in the Vagabond Mini™ Lithium system is a 14.8V, 8.8AH lithium ion battery rated at 130 watt-hours.” Is there enough info in that description to tell me the appropriate sized inverter power? Amazon has items like at 300 watts. Thanks, Steven. Just guessing here.. watts=amps x voltage, so 8.8 amps x 120 volts = 1056 watts.. so I’d need an inverter that pushes at least 1100 watts? Your charger won’t run that many watts. That’s a hair dryer! The charger will be marked with the number of watts it consumes. Ask the manufacturer what the charger consumes and double it for safety. I’d be surprised if the charger used more than 100 watts. My laptop charger – a big hulk – outputs 20V and consumes 135 watts. Logic just kicked in. I just need to find out how many watts the charger – not the battery – needs to draw as input. And the 8.8AH spec must be the output of the battery. Nevermind..! I’ll post the answer for completeness. A small 100W 12VDC to 120CAC car inverter can be bought for around $20 at Wal-Mart or truck stops and will work fine. I’d go for double or triple that. Extra capacity means you can also be charging something else and not risk blowing fuses. Thanks again, Steven. I have my eye on a Belkin 300w with 2 AC outputs that has pretty good reviews on Amazon. This is a good source if you’re using one of the more recent Rebel (5xx) models which use a smaller battery pack. Hello, I’ve found some very useful information on you site, I just want to get some advise from you. Do yo think it will be able possible to power Canon 5D II with these battery? Is 9v is ok for Canon? I did a quick look at the items you’ve indicated and they all look like they could contribute to a portable, high efficiency power solution. The tricky part will be getting all of the connectors to match in size. You may have to resort to cutting and rewiring connectors. Regarding your question about feeding your camera 9 volts instead of 7.4 (or 7.2), I don’t recommend it – in part because I don’t want to hear from you or your attorney if you destroy your camera or the town you live in! Lithium batteries CAN be deadly to you and your camera if not treated properly. 9 volts refers to the nominal voltage and the actual voltage may be quite a bit higher. Awesome idea! The best part is I have all the parts I need laying around. I don’t know why I didn’t think of this earlier. Thanks! Would the Stanly 300-amp Jump Starter from Lowe’s work as well as the Black and Decker? It is somewhat cheaper. How did you do it with the LP-E6? Can you show some photos? Did you take out the Li-ion batteries installed with the LP-E6? Thanks. I also tried to make an LP-E6 battery eliminator from a new (but cheap) LP-E6. I gutted the battery and soldered wires. The outcome was less than stellar as the contacts in the LP-E6 are small and very close together. Canon sells the ACK-E6AC. Cost is about $140. Like the ACK-E2 the ACK-E6AC includes a battery eliminator and an AC wall unit. However I found an equivalent unit for $39. No need to struggle with disassembling and soldering a battery eliminator! The $39 unit I originally linked has many reports of problems with the AC adapter. I haven’t used that, just the DR-E6 (battery eliminator) portion. Search Amazon and you’ll find many similar products at even lower prices.